Congratulations Marissa & Mike! 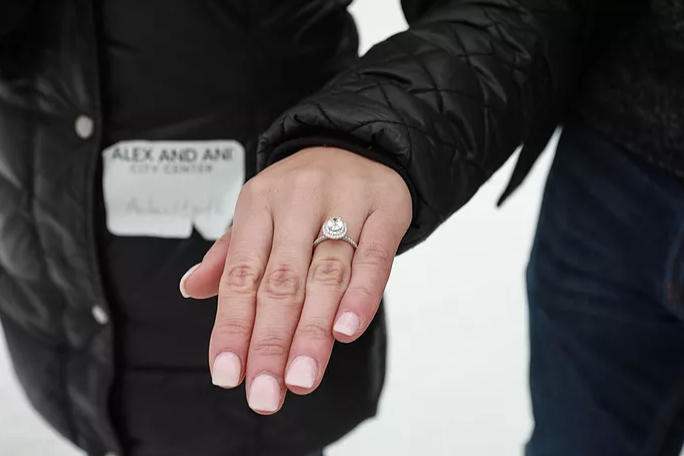 Mike proposed to Marissa while ice skating with her and her family. Mike surprised Marissa with small gifts each week of December, leading up to this special moment! In high school, Mike would have wood-shop in the classroom next to my art class and we would always pass by each other when the bell rang. Even though we went to the same high school, we didn’t know each other until we met at a carnival in August of 2010, when we were 15 and 16 years old. I was there with my girlfriends, and Mike was there with his friends. We had mutual friends from that group and all met up that night at the carnival. My girlfriends and I were going on a ride, and I asked Mike to hold my phone and dangly earrings so I could go on the ride without losing all my stuff. I’m sure he thought I was a little crazy but he held my stuff anyways! We exchanged phone numbers and after that we pretty much spent the rest of the summer together, and started dating shortly after. At the beginning of December, Mike told me that I would get my Christmas gifts a little different this year since I hate surprises and hate waiting til Christmas to open gifts. He explained that every Sunday in December, I will get one gift leading up until Christmas. Obviously, I was so happy because who doesn’t love getting early Christmas presents! The first Sunday, he took me to Providence Donuts and surprised me with a dozen red roses and my favorite candy! The second Sunday, he gave me a gift card to Express so I could get the sweater I had been eyeing. The third Sunday, was so special! He gave me a shadow box filled with hand written notes we had wrote each other in high school and pictures, some from high school and some from the years leading up to 2017. For the Sunday (Christmas), he gave me money to get my nails done. Little did I know that all these special gifts would lead up to the happiest day ever. The final Sunday, December 31st, he told me we were going ice skating with my family. It was one of the coldest days, so I sort of complained but went anyways. We skated around a few times, trying to keep warm. After a few laps, Mike passed me over to my mom, while him and my dad skated away. I figured they were tired of slowly skating around with my mom and I, while we tried not to fall. In that time, my mom distracted me while my dad handed Mike the ring. After the exchange, Mike skated up to me and grabbed my hand, and we skated around together. He mentioned how 2018 was going to be a great year and I agreed. Suddenly, he spun me around and said “well, there’s one more thing I want to do before 2018” and reached into his pocket, and began to get down on one knee. I immediately realized what was happening and instantly started crying! He said “Will you marry me?” But I don’t think I even let him finish saying that before shouting out “YES!”. Everyone around us cheered and clapped, and my parents skated over to hug us and see the ring! Mike also pointed out that there was a photographer that he had hired, on the side, taking pictures of the entire thing, and I cried some more happy tears! It was a dream come true! Several months prior to us getting engaged, we had gone to Providence Diamond, just to look at some rings and try some on. I fell in love with all of the oval Sylvie engagement rings, and instantly knew that would be my ideal ring. Following that visit to Providence Diamond, any time I saw a picture of an oval diamond ring on the store’s Instagram, I would tag Mike in it to make sure he didn’t forget what I liked. Little did I know, shortly after our visit, Mike had already gone back into the store and started to work with Steve to design my dream ring! Thank you Marissa & Mike for sharing your beautiful story with us!